← A clattering of Jackdaws. All lit up with a Tilly Lamp. 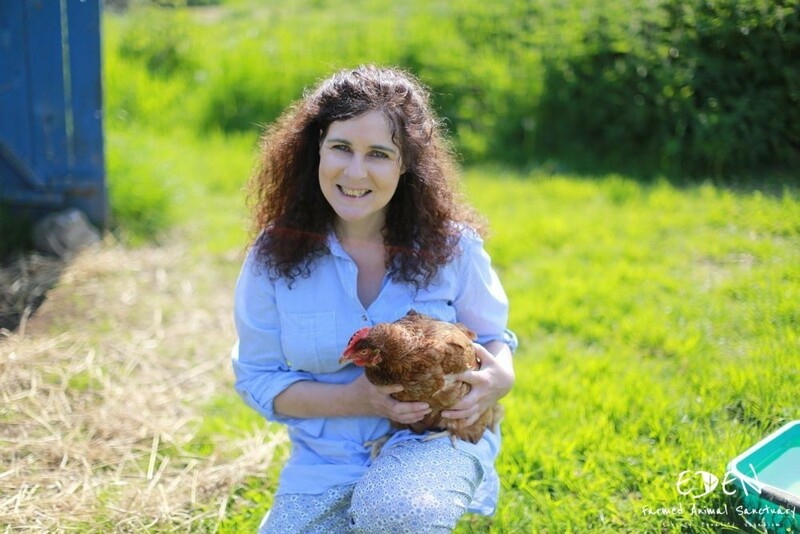 Sandra with Claudia – another trafficked hen. No, I don’t know what she does with the eggs either – they pop out what ever she thinks. Perhaps she boils them humanely. The Mister Whippy ice-cream van is already in position, no sign of a burger van – too many vegans I suppose. The beleaguered boss of the Fracking company was pointing out in vain that his was the most highly regulated fracking site in the world; he was being measured for air quality, water quality, and traffic disturbance – the environmental agency had already done 6 inspections and he hadn’t even started work yet!!! I often feel like writing these days, but then the pain returns, or the nurses have some procedure they need to perform, or the Doctor is calling in – life is never as quiet and organised as it used to be when I jumped out of bed and sat down in front of my computer and started another post…..but today that music exercised me and I wanted to know more about it. What was it called – Garage Band? If you know the answer please let me know in the comments, it’s driving me nuts. I’ve been led on a merry dance. Somewhere along the line, I found the original track for Rolf Harris’s Waltzing Matilda. Practically the Australian National Anthem these days. Veering off on a tangent, as I often do, I pondered on it’s fate. Had it been vanquished from sight in the same manner that all Jimmy Savile’s Top of the Pops appearances had been? After all, Savile had never been found guilty of heinous crimes, only ‘believed to be so’ – whereas Harris actually had been convicted, however unfairly. Nope, Waltzing Matilda was too much a part of the fabric of Australian life to suffer the same fate it seemed. There is even a museum dedicated to the song! It burnt down a couple of years ago. Now I was firmly on the track of Matilda – my mind works like this, in case you haven’t noticed. The tune to Waltzing Matilda is actually Scottish – “Thou Bonnie Wood of Craigielea”- if you really want to disappear down a rabbit hole try googling that marching song….Ms Raccoon did, and didn’t emerge for an hour or so – the things I do for you! So almost back on track with Matilda, and what is this I find? If its not Matilda Higgins…. The night she was dying I promised her I would dedicate the rest of my life to vegan education. In her memory I opened Matilda’s Promise, Animal Rights & Vegan Education Centre. Go Vegan World is one of the activities of that centre. It must have been a moving evening, comforting young Mathilda as she lay gasping for breath, I have tears in my eyes as I think of it. Perhaps I should open the first Palliative Care Centre for Hens? Anyway, moving smartly along, Matilda’s ideas have gathered so much financial support that she has enough money to buy full page adverts in many of the main stream media’s dying organs. They, of course, are so short of money these days that they don’t care where the money comes from. So today I had a visitor carrying a full page from the Daily Telegraph. ‘You are going to love this’ he said. He was right. It seems that Sandra is now campaigning to have us stop drinking milk. ‘Humane Milk is a Myth’. Calves are torn from their Mother’s who are still bloody from birth (watch the terminology) and are searching frantically for their daughter’s. They tremble piteously and drink milk from rubber teats on the wall instead of their Mother’s nurturing bodies. All because human’s take their milk! Their son’s are slaughtered for their flesh, and they themselves are slaughtered at 6 years old – their natural lifespan is 25 years. Now we may not agree with gummint, and think they should be replaced with dreadlocked morons like young Sebastian but surely before they go they could pass a law for us saying that it was illegal to traffick baby calves and stop people having milk in their tea? Think of Matilda. Her feathers gradually fading in colour – do they have Hen Ketamine? Tilly is short for Matilda. In case you didn’t know. Just thought you’d like to know where my mind had been today, wandering along all sorts of paths – don’t think I’ve actually lost the plot yet, but my ability to write a serious post is still in doubt. So it’s either nothing, or put up with my meandering. We have so much to worry about in the modern world. I rest my case M’lud, Madame can still pen with the best of them. I hope that an Oxford comma might have helped there, though given the preceeding Dolittle-ishness perhaps not! Where do I apply to no-platform a bloody hen? I prithee allow me to do a little meandering for you, ma chère Dame. Signor Bandini’s fault … as you’ll see. Let me start by pointing out — lest any be in doubt — that the ‘Oxford comma’ is a style of the publishing house — the O.U.P. — not a diktat of the Congregation or some fortieth Article! I respectfully submit that the Oxford comma is illogical: any-one feeling the need of a punctuation mark before a conjunction might like to use a semi-colon; far better, in most cases, would be to start a new sentence (with or without the conjunction). And, ere some-one object that he ought not to begin a sentence with a conjunction, let me remind him that the ancients did so frequently and harmlessly. If, in the sentence quoted by Bandini (“Facilitating …”), be intended to mean what I suspect, the trouble with it is her use of a $50 word where one for a dime would do: she surely means “Enabling …”. Furthermore one has ‘a right to’ something not ‘a right for’ it. Still, at least she says “as we do”; most modern youngsters would say “like we do” … like! In any case, how can some-one that thinks animals capable of making such demands claim to know anything about them? [Aside] Enough meandering, Number One: resume course! Meander away, ma chère, if this is the result! I’m not sure they would appreciate it, though; I’m reminded of John O’Farrell’s description of a well-meaning adoption of a liberated battery chicken and his three ‘free-range, airy-fairy middle-class chickens’ huddling nervously together while the ‘fat skinhead of a battery chicken charged down the steps at 40 miles an hour and pecked them in the head’. Owen, Dr Liz remarks that the “Police will currently only investigate when a victim comes forward” – as though this were a bad thing! [Presumably she knows that the police were investingating a mere 19 years ago? Can we start a Gofundme to send her to preach her gospel to the Sami, Faroese, Inuit, Australian aboriginals and other benighted native peoples across the world? I’m sure they’ll be amazed to learn about all the grains, beans and lovely green leafy veggies that they could be eating instead of meat! But of course, she never will. She knows damm well that total veganism is a fad that’s possible only for well-off Westerners with access to a cornucopia of imported out-of-season food. Speaking of native peoples and their cuisine, I wonder what her views are on eating insects? They’re reckoned to be very nutritious; killing them doesn’t involve bloodshed or cruelty and they don’t gaze at you with big sad eyes as you raise them to your lips…. Chickens eat worms and insects as well as grain and other seeds. They are definitely not vegans. Well put, Mrs. Grimble. The other thing worth mentioning about vegans’ ability to survive on a diet other than the one for which evolution has cast us is the First World’s unlimited access to dietary supplements. Interestingly Capt. Scott found killing the trusting seals the most unpleasant aspect of his polar exploration but, once they’d run out of meat, they had no choice: it was their only way of ensuring they had enough vitamin C.
Thank you Macheath! I love the image of the skin head chicken charging full pelt to give them a Liverpool kiss…. When did the Vegans get out of the hyperspace bypass business?